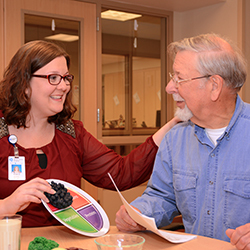 Our registered and licensed dietitian at Clarke County Hospital can provide both inpatients and outpatients with expert guidance in various food, diet, and nutrition issues. Whether your challenge is a specific disease like diabetes, a food allergy or intolerance, or weight loss or weight gain needs, a dietitian can translate food and nutrition guidelines into practical information that supports your healthy lifestyle. Common health conditions that benefit from nutrition counseling include diabetes, heart disease, including elevated cholesterol and congestive heart failure, high blood pressure, celiac disease, kidney disease and acid reflux. Counseling is available with a physician referral, and insurance coverage varies. You may wish to contact your insurance company for details before enrollment. Clarke County Hospital is a proud partner of Aramark and will provide a select menu to each patient based on their physician prescribed diet order. Our menus have been carefully planned to provide patients with selections that meet their unique dietary needs and follow healthy eating guidelines. Our CCH Café which is located on the first floor, is open to guests, employees and volunteers.